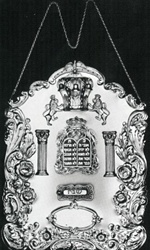 The excellent craftsmanship is apparent in this beautiful solid sterling breast plate. Large (14 inches high x 10.5 inches wide) and small (10.5 high x 7.5 inches wide). May be personalized with custom inscription.